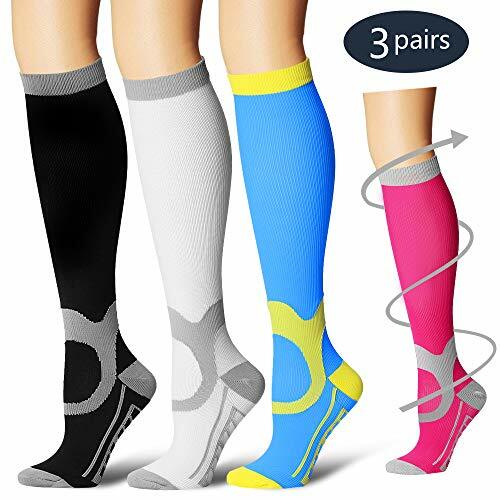 BLUETREE Compression Socks,(3 Pairs) Compression Sock for Women & Men - Best for Running, Athletic Sports, Crossfit, Flight Travel（Multti-colors11-L/XL） by BLUETREE at Enria Industries. MPN: Papikin-050-Multti-colors11-L/XL. Hurry! Limited time offer. Offer valid only while supplies last. COMPRESSION SOCKS WOMEN AND MEN- OR are these the new age IMPRESSION SOCKS? Gone are the times when Compression socks were viewed as medicinal products. We have mastered the art of combining fashion, technology and science to bring you the triple comfort without making you overpay. BLUETREE compression socks are designed to be the best amongst the market while providing a greater comfort with breathable and moisture absorbent material. THE IMPRESSION SOCKS - The smooth heel and toe provide unmatched comfort. We carefully designed and manufactured our compression socks to provide premium support, comfort, and relief without compromising your mobility. Form fitting, lightweight, and breathable fabric features maintain joint stability regardless of activity.Fashion color,Unique pattern design, Make Fun in life.add a touch of color to your ordinary life. it is ideal for those who sit for long period during travel or at work. BEATING OUT THE COMPETITION -our knee high compression socks' material are upgraded with nylon percentage from 40% to 85%, Delivers 360-degree stretch for greater flexibility and durability. Breathable high performance fabric maintains an optimal temperature. Bacteria and moisture for maximum level of comfort. Our compression socks (20-30 mmHg) are recommended by doctors and preferred by trainers. No other offering on the market provides with such competitive price with same quality.